Sometimes we all scream for ice cream but other times nothing but creamy Italian gelato will do. So what's the deal with both frozen concoctions, aren't they the same thing? Absolutely not! 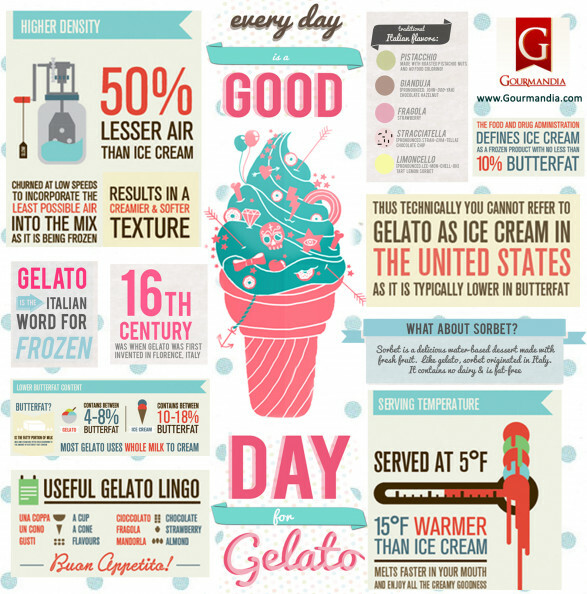 This cool infographic from Gourmandia gives you the full scoop on what sets gelato apart from its American counterpart. For starters, gelato is typically made with whole milk instead of cream and is churned at lower speeds, which results in it containing 50% less air than ice cream. Gelato is also served at 15 degrees warmer than ice cream which means it melts quicker. So be sure to devour it all before it melts into a sweet sticky puddle. Want to find out more? Check out the information below.